The riddle of the Orchard pegmatite intensifies or perhaps the solution is in front of our face and under or feet but the conclusion is not palatable. What is clear at the moment is that the schist xenolith within the vein is becoming the dominating feature. 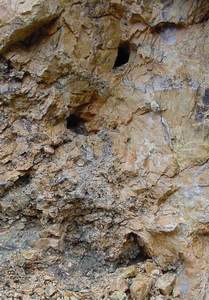 In the image above, the pegmatite injection appears to have flowed around this blockage and forced its way into the sidewall. At the top and bottom of the headwall the contacts can be clearly seen. Beyond the headwall the original prospect pit is visible. The pegmatite forced into the side just in front of the headwall consists of salmon feldspar crystallized to form a structure almost as if it was made of tiles. Within this structure are numerous pockets. These pockets have yielded yet more apatites, albite plates, beryl casts in albite and feldspar, and quartz crystals. Some of the more quartz filled pockets are unique in that the crystals are still radiating inward from the pocket walls and still firmly attached. Only a light rusty film covers these gemmy quartzes. Would these be gem beryls still implanted….. The portion of the pegmatite above the schist inclusion is dominated by a quartz core. We have not seen such a large amount of quartz heretofore at the OP. The quartz appears to be 'bull' quartz although it is quite gemmy in spots. There are just a few beryls just above the quartz mass. Underneath it grades into vuggy feldspar and eventually into schist. Where the quartz does contact the schist, the contact zone is ends in quartz crystal points. An 8' test drill done just at the base of this upper segment against the headwall did not contact schist. This gives us some encouragement that the schist xenolith is just that and perhaps the pegmatite continues 'top to bottom' up strike. 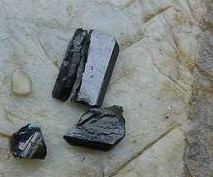 The portion of pegmatite that has been displaced left has all of the characteristics present in the more regular part of the vein. There is a mini quartz core with feldspar and abundant green and blue beryls. Some of these beryls are quite blue but unfortunately the amount of material is quite limited . As in the past, the interesting part of pegmatite is below the schist. The disturbing thing now is the schist is occupying a greater and greater volume with a concomitant reduction in pegmatite. What little pegmatite remains is quite interesting. We have mined into a zone rich in radioactives judging by the amount of very dark quartz and the appearance of golden beryls. In shot at the top some very large beryls are starting appear. Notice the striking orange beryl within the mass of black quartz. Removing some of this black quartz exposed a very large yellow beryl underneath the orange one. It demonstrates also how the green beryls trend to yellow within the dark quartz. While removing the quartz, several small yttrium(?) rich columbites popped out of the smoky quartz. Embedded in the quartz they were nearly impossible to see. Below the radioactive zone we found 3 basketball sized pockets. We had not found pockets of any size for a considerable time within the main body of the vein. These pockets contained small well developed microclines, albites, a few beryl casts, and, of course, quartz crystals. There were also some gray apatite singles to 2 cm. In the photo, Richard is standing just to the right of a pocket exposed in the floor. The contacts are clearly visible.